One of the largest and most beautiful beetles of the Neotropics, the Harlequin Beetle is named for the ornate, colorful red, olive & black pattern on the elytra (hardened wings) of both the male and female. This beetle is a member of the longhorn beetle family, Cerambycidae; members of this family have long antennae, often longer than the length of their body! Adults have a body length of close to 8 cm, and males are particularly impressive because they have elongated forelegs, extending much longer than the length of their body. 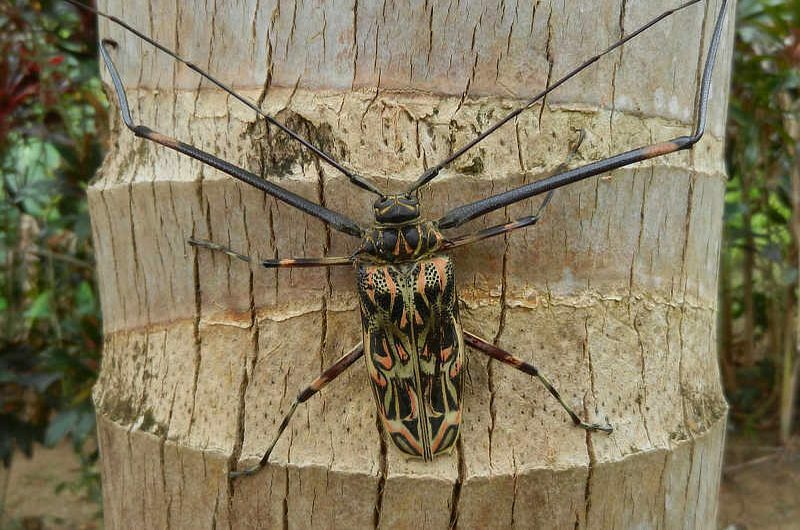 Harlequin Beetles are found from Mexico to Brazil; they can be found on the bark of trees on which they feed on sap and lay eggs. This male was spotted at the Canopy B&B in Gamboa.